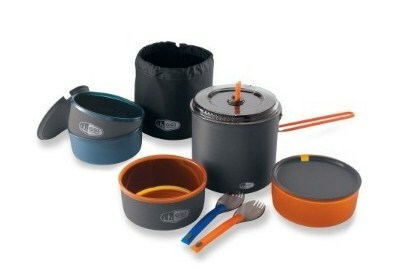 Take the GSI Outdoors Pinnacle Dualist Cook System on your next backpacking or camping outing. This set includes includes 2 insulated mugs with lids, 2 bowls, 2 telescoping foons (fork/spoon utensil combo), a welded sink/carry bag, and a hard-anodized 1.8 liter pot with strainer lid. Carry easily and lightly since the mugs nest inside the bowls, which in turn nest inside the pot. Great gift for the avid camper.